This is a modified and updated post that was originally published in CMS Wire on June 1st. We live in an era where there is more information available to a digitally savvy human than has ever been possible in the history of mankind as we know it. The volume growth implications are so significant and substantial that it is worth considering some contextual facts to get a proper understanding of this fact. The Encyclopedia Britannica announced in 2012 that after 244 years, dozens of editions, and more than 7M sets sold, no new editions would be printed. The 32 volumes of the 2010 installment, it turns out, were the last edition of this great publication. The primary cause for this was the increasing use and relevance of the Wikipedia (and other digital alternatives) which would cover 2,670+ Encyclopedia Britannica sized volumes if it were to be actually printed. While some may argue that the Wikipedia is less reliable, this contrast is quite astonishing and clearly, there is more information. This explosion of content is even more astounding if we survey the larger information landscape which reveals the following fact described in the graphic below. This explosion, however, presents special challenges to the modern enterprise which now needs to assimilate, digest and determine what is relevant and what is not. In this age of digital disruption, those who fail in doing this becoming increasingly irrelevant, as we have seen in the retail industry in particular. Once iconic brands now fall by the wayside, and will quietly disappear e.g. Sears, Toys R Us, and many more. 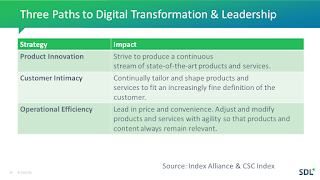 Studies by experts suggest that many more companies, across many industries, will disappear because they fail to understand the changes in values and priorities inherent in this content explosion and the related digital disruption it causes. The behavior of the modern customer has changed and is now much more affected by freely flowing content. In fact in many B2C and even B2B scenarios we see that the modern customer may conduct the whole customer journey without ever talking to a salesperson. Studies show that as much as 67% of the buyer’s journey is conducted digitally (though some put a different spin on that statistic), and customer behavior driven by content that they discover. It can be said that in the modern era, companies that provide relevant, high-quality content succeed, and those that don’t, become irrelevant. 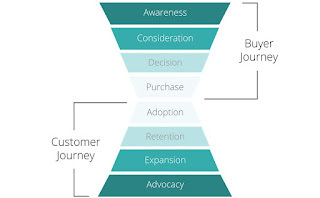 The following graphic shows the many stages at which relevant customer content is required to persuade and develop a deeper engagement with a potential customer, and then maintain an ongoing relationship with an enterprise or a brand after a customer relationship has been established. Now, consider doing this across the many languages that are needed to engage and connect with the global customer, and we see the crying need for not just translation of mandated packaging materials, but translation capabilities that can support the constant and always updating content that may influence a buyer in their evaluation and decision-making process. And, also provide adequate information support in the post-purchase phase of the relationship. While historically corporate marketing had a great degree of control, today most consumers distrust or at least prefer additional sources of this kind of product messaging, and many would rather trust the shared customer experience of fellow consumers. The value of business content increasingly has a very short shelf-life and thus traditional (slow and expensive) translation approaches are increasingly questioned for information that may have little or no value after six months. In actual fact, the fastest growing type of content is actually user-generated content (UGC) that is found in blogs, FB, YouTube, Twitter and community forums. It is estimated by IDC that 70% of the content on the web is UGC and much of that is very pertinent and useful to enterprises to understand trends and customers better. This content is now influencing consumer behavior all over the world and is often referred to as word-of-mouth marketing (WOMM). Consumer reviews are often more trusted than “corporate marketing-speak” and even “expert” reviews which are often funded by the same corporations. We all have experienced Amazon, travel sites, C-Net and other user rating sites. It is useful for both global consumers and global enterprises to make this multilingual. It is estimated that as many as 600 billion words a day are translated by computers today, across the various MT (machine translation) portals. This dwarfs what the localization and professional business translation industry does by a factor of more than 99X! Recent reports suggest that a new MT developer, Alibaba, does as much as 200 billion words a day alone on their various eCommerce platforms. This brings the total MT word tally up to almost 800 billion words a day. Clearly, global customers need specific information that may not be available in their native tongues, and they will use MT to get at least a gist of what they need to understand. While many continue to moan about the imperfection of MT quality at a human linguistic quality assessment level, we have already reached a point in human history where the substantial bulk of language translation being consumed on the planet today is being done by computers. Global customers who research products and services, can and will get many disparate sources of information, that is not controlled by an enterprise to make their evaluations on whether to buy a product or not. MT will allow them to get access to non-native language content, and instantly obtain a translation that is “good enough” to support a personal evaluation process. In our modern times, we’re experiencing a state of unprecedented connectivity thanks to technology. However, we’re still living under the shadow of the Tower of Babel in terms of global human communication ease. Language remains a barrier to business and marketing. Even though technological devices can quickly and easily connect, humans from different parts of the world often can’t. And traditional translation service offerings simply cannot scale to the real translation needs of the modern enterprise without leveraging technology in a substantial and competent way. To enable information and document triage when dealing with large document collections and help to identify highest priority content from a large mass of undifferentiated content. This process also helps to identify the most important and relevant documents to send to higher quality human translation processes. One can find this combination of requirements in several customer communications oriented functions like providing technical support knowledge-base, eCommerce product listings, customer service/support, and customer experience reviews for all kinds of products and service experiences. However, in an increasingly digital world, we see that the need to be able to process large volumes of business content will only grow, and the need to identify what is most relevant and valuable for ongoing international business mission needs is becoming a critical success-enabling technology requirement. Competently deployed machine translation technology, that is properly integrated with relevant content flows to enhance customer experience, solves high-value business problems that further and enhance any and all global business initiatives. A content explosion that makes huge amounts of information available to global customers to help them understand products and services on a scale that has never been seen before. Much of this content is out of the control of the modern enterprise but yet it can deeply influence the behavior of potential and existing customers of the enterprise. Understanding what is most relevant and important is also becoming an increasingly more valuable skill. An era where content is increasingly your best salesperson and customers everywhere will use digital content to make purchase decisions. For an enterprise to be relevant in the modern era they will need to be present at every stage of the buyer and customer journey with relevant and high-value content. 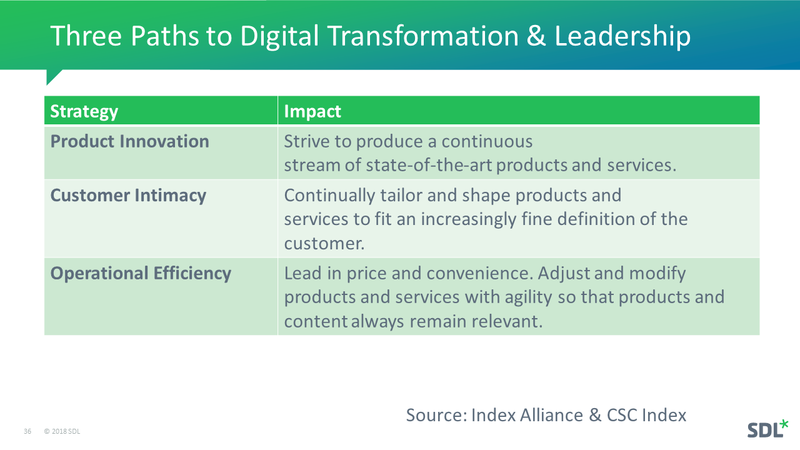 Those that provide the best digital experience (DX) with relevant content will thrive and prosper, and those that do not will struggle and fail. The modern global customer expects to get as much content and information in his language as his counterparts across the world. MT technology use will continue to accelerate to support these needs to make relevant content visible in a timely and efficient manner. MT technology will continue to improve as the smartest researchers in the world continue to focus on it. Thus, in this era of digital disruption, content-driven customer engagement, and B2C relationship building, where global customers want access to the same content that their English speaking counterparts have, what is the leadership at a modern enterprise to do? An understanding of what is relevant content within the deluge that every enterprise today faces. The need is to increase relevant communication not just make any random content more available. An alignment of the content development and management strategies, with efficient and optimized translation processes that enable the enterprise to quickly reach a global audience. Content creation needs to be aligned with content transformation (translation) and delivery strategies. 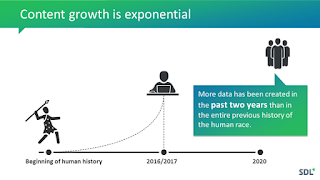 An understanding of the new AI-based emerging technologies that will help the enterprise to rapidly evolve to producing relevant content and establish a global digital presence so that the relevant content is delivered to the right customers at the right time. In a respected paper published in the Harvard Business Review, the authors point out three building blocks that can help drive a modern enterprise into building a market leadership position in this age of digital disruption. The building blocks are summarized in the graphic below. 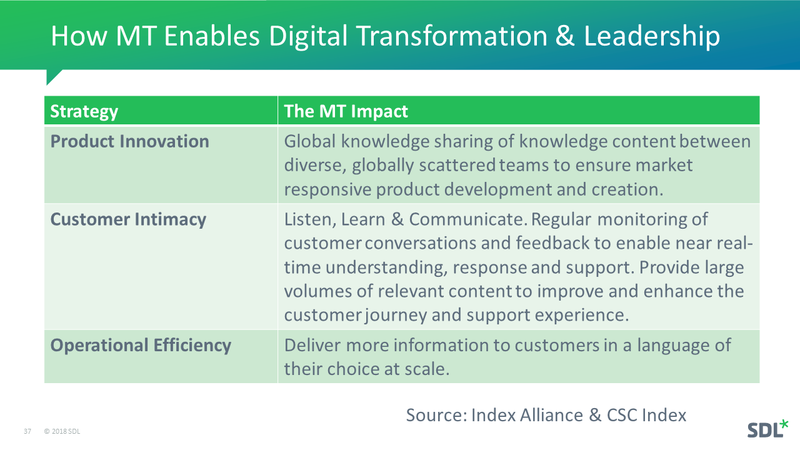 And for those who look carefully, we can see that MT has now reached a point of being a critical and strategic technology to assist in this digital transformation. 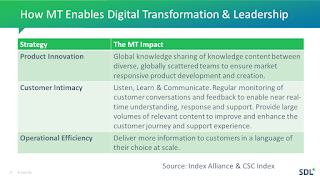 MT enables the communication that enables and underlies product innovation from global teams, helps an enterprise to understand and communicate more effectively with customers across the world, and, also enables efficient delivery of highly relevant multilingual content across the world to build market leadership.